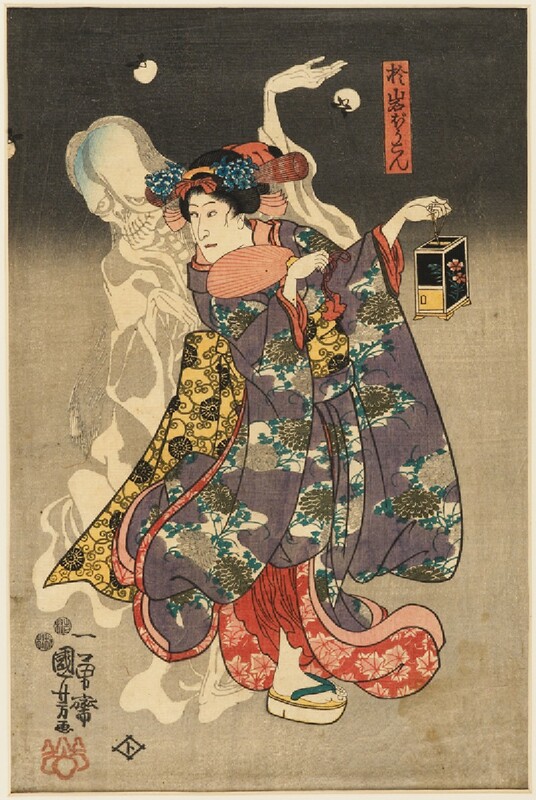 The ghost depicted here is Oiwa, a woman whose husband is seduced by a rich neighbour and persuaded to poison his wife. The wretched Oiwa dies in agony, hideously disfigured by the poison, and her restless spirit returns to torment her murderous husband. The Tale of Oiwa, with its elements of betrayal, murder and ghostly revenge, was turned into a highly successful kabuki play in 1825. 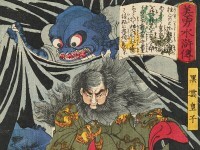 It later became a source of inspiration to a number of ukiyo-e woodblock print artists, including Kuniyoshi. Ukiyo-e, or ‘Pictures of the Floating World’, depicted leading courtesans, kabuki actors, and others from the urban pleasure districts, in popular woodblock prints and paintings.